Copyright: Your photos will never be used outside of tree-nation.com, facebook.com/treenation, facebook.com/EcologicalMind without your previous authorization. Do you have a favorite tree? 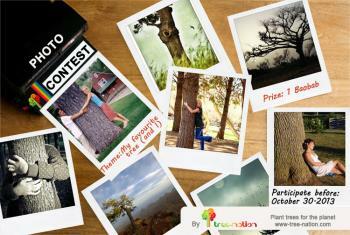 Take a picture of your favorite tree that highlights its beauty and participate to our latest photo contest! And…if you want to appear in the photo too, you are very welcome! 2 winners (the most voted photo and the most beautiful photo) will be awarded with a Baobad, that we will plant in our plantation in Niger to fight against climate change and desertification. Online submission of digital photos via Facebook. 3 pictures per person. Please describe the species as much as possible, e.g. the place and the story behind the shot.